A countess flees home—and the family curse requiring her to marry a prince—to hide out in the South Carolina low country. There, she meets a man who’s not quite a prince…but who steals her heart all the same. Find out what happens in the fifth installment in Jennifer Chance’s Crowns and Gowns series, CURSED! When the prince she was supposed to marry falls for someone else, Edeena Saleri is done with Garronia's courts, crowns, and family curses. She grabs her sisters and escapes to the nobility-free coast of South Carolina, USA. Vincent "Prince" Rallis has spent his whole life justifying his name. The son of hardworking immigrant parents, he's hustled for every dime, finally building a personal security firm with the muscle and grit to live up to its promises. He's used to keeping his cool, but when the high-strung, high-class Edeena shuts him down despite her obvious interest, pride demands he fight for her--even if he has to track her back to her glittering court to prove his point. Only once Prince arrives in the seaside kingdom of Garronia, he finds his troubles are just beginning. Sometimes love in Garronia can be magic. And sometimes you're just Cursed. Cursed by Jennifer Chance is the fifth book in her Gowns & Crowns series but the first that I have read. Despite being part of a series, this book can be read as a standalone story. However, after reading this book, I am tempted to go and read the others! Cursed is a sweet romance about Edeena who, along with her two sisters, has come to the United States to get away from her father who is adamant on marrying her off and she is under pressure to marry a Prince who can lift the curse on her family. But here she meets Vincent "Prince" Rallis and sparks fly. I enjoyed the romance between Edeena and Vincent and fell in love with Vince with his dynamic and commanding personality and his dedication towards the people he loves. There is much grumbling about the curse which frankly I didn't just get but still sat hooked thumbing the pages to get to the good stuff which was the romance and the by-play among the sisters. Edeena's self sacrifice is noteworthy but sometimes felt a little overdone but still Vince got her out of her own head every time she was ready to fall in despair and I love him for supporting his woman all through. I enjoyed visiting Garronia and meeting the other characters that have me intrigued and now I am eager to read their stories. Edeena's father's actions are unjustifiably cruel and nothing about him endeared him to me. No matter that the author tries to give a compassionate side to his story, I just didn't feel empathy for him. Jennifer Chance's writing style is vivid and fluid and I enjoyed her narration. The story has drama, romance, humour and a happily-ever-after that left me all smiles and eager to get my hands on the next book in the series which hopefully will be about one of the other two sisters. The only thing I didnt like about the book is the cover which gives a whole other impression about this book and had I not read the blurb, I would have skipped this book altogether because of it. All in all, I loved reading Cursed and was thoroughly entertained. I loved loved loved Vince and could not get enough of him. Hoping to read more from the author in the future, I give Cursed by Jennifer Chance 4 stars out of 5 and recommend it to all romance lovers. I received the book for review from the author and the tour organizers and I am very thankful to them. The above review is my honest and unbiased opinion and in no way influenced. Add Cursed to your GOODREADS TBR stack! Jennifer Chance is the award-winning author of the new adult Rule Breakers series as well as the contemporary romance modern royals Gowns & Crowns series. 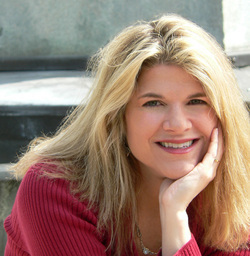 A lover of books, romance, and happily-ever-afters, she lives and writes in Ohio. In addition to her work in romance, she is also Jenn Stark, urban fantasy author of the Immortal Vegas series, and Jennifer McGowan, YA author of the Elizabethan spy series The Maids of Honor. She is truly NOT trying to become 27 Jennifers, but it's getting a little dicey.